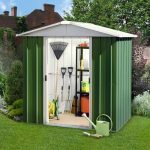 This compact shed is perfect for smaller yards or for fitting in a small corner to fit just the essentials. 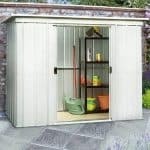 With 3’5” x 4’9” of space you’ll have just enough room for your gardening tools, outdoor care items and a few toys. 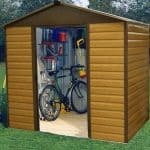 The zinc-plated finish combined with the slanted pent roof keep the elements from wearing the shed, helping it last. 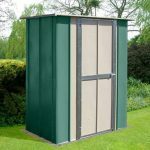 Stainless steel frame and cladding means that the structure of the unit won’t waver or rust with time. 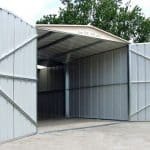 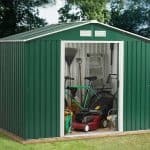 This shed is perfect for those not looking to make a big investment, but just want some easy, long-lasting storage space.